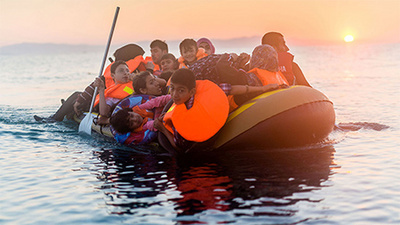 The EU Refugee crisis can not be effectively tackled without addressing the root problems. Why the unique higher education program for development in conflict zones with or without internet connectivity is the key to stop refugee flow? Is this the cheapest, most effective and most durable way to eventually reverse the trend by stabilizing the sending countries for a longer run? Dunya University of Afghanistan (DUA), in association with Swiss UMEF University of Geneva, has developed a new, critically-needed education programme for delivery to the population of Afghanistan. Drawing on the expertise and extensive experience of leaders from Afghanistan’s higher education sector and faculty from around the world, this initiative provides access to high quality higher education specifically designed to respond to the needs of the Afghan population, whose country continues to suffer the impact of decades of war. One of the major problems in Afghanistan for over 40 years now has been the lack of access to education across all sectors of society. We have therefore developed a new method of teaching open to all – at no cost to the student. The key innovation of this integrated, progressive programme is its flexible access using three methods of delivery: teaching by television, an online learning platform and offline learning (with CD course and textbook package). This means that the programme is accessible to all communities, including those in conflict zones, as well as to different learner groups, economically, geographically and culturally. The initiative’s rationale is anchored in the critical need to develop an educated and confident population in Afghanistan, and in doing so, nurture future leaders with an ethical focus on the interests of the country and region – and the world. By providing high quality education opportunities to diverse groups in all sections of the population, this programme promotes and supports future economic prosperity, stronger social cohesion and therefore greater security in Afghanistan. Students are offered undergraduate and graduate modules in relevant subjects including management and business, finance and economics, innovation, leadership and diplomacy. All courses are designed and led by expert international faculty, with syllabi specifically adapted to the social and economic needs of Afghanistan, such as leadership courses for women and courses designed to foster and support entrepreneurial activity. The courses are available in English, Dari and Pashto. Delivery of the learning programme via three channels gives students optimum flexibility and accessibility: DUA’s online platform serves those students in areas with connectivity, while the offline CD and textbook packs means students with no internet access can also follow the programmes. DUA’s own television channel is dedicated solely to educational broadcasting and allows communities in even remote or conflict-affected zones to access the education programmes. Quality-controlled assessment will take place through interim exam centres set up in regional locations according to local enrolment numbers. This sets the programme apart from education delivered purely online, by maintaining rigorous, university assessment standards. Due to the ongoing shortage of higher education provision, more than 150,000 people annually remain unable to obtain a university place in Afghanistan. Our programme offers this sector of the population the opportunity to gain an education to support both their future and the future development of their country. It also provides young people who would otherwise leave Afghanistan with an incentive to stay in their country, and achieve success as students, citizens and potential future leaders. A quarter of refugees worldwide are from Afghanistan. Afghans make up the second largest refugee population in Europe, with at least 64,000 applications for asylum so far this year. The Afghan population needs the opportunity, incentive and motivation of accessible, quality education in order to build confidence within the country and region. Our initiative is supported by DUA’s existing reputation in Afghanistan as leading education provider and trusted brand. We are very proud of this unique programme, which has been developed by academic experts of over 20 nationalities during a period of over five years. The faculty and researchers involved in development of the project have significant experience in education in conflict and/or post-conflict zones, and all bring their commitment to development of accessible education to support leadership for peace and security. Following successful delivery of this programme in Afghanistan, our aim is to make this programme available as an effective model for other conflict and post-conflict countries in world. Dr. Djawed SANGDEL, professor of Entrepreneurship, is the Swiss UMEF University Rector, based in Geneva, Switzerland. He authors numerous publications, applied research findings, programs and projects on three continents.